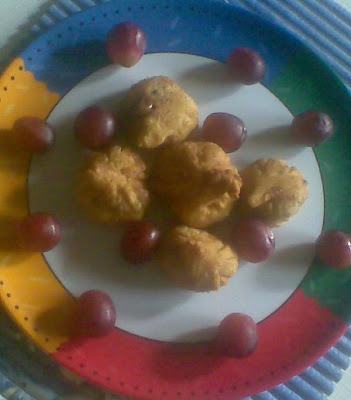 Fried Fruit Balls is my own version I tried and tasted..It is nutritious and healthy. It can be made in few minutes of time and it tastes really good and delicious snacktoo..It is great hit in my home. 2. Divide the dough into small balls ; Keep these balls aside. 4. With greased palms take one ball of dough, flatten it into a disc of the size of palm. Place one spoon of fruit stuff in the center and fold all the edges of disc to cover the fruit balland fry deeply and serve hot. 5. Note: Coarsely chopped nuts, such as walnuts,cashew, almonds, can be mixed in with the fruit balls filling giving these fried balls an extra crunch. Fried fruit balls what an unique recipe.......It sounds very healthy and nutritious....Its new for me.Will try it. New recipe for me.... good way to eat fruits :) Nice presentation Jaishree! Hi jaishree, this is a new dish to me and a yummy balls. will try it soon. Nice one, dear. Why dont you send it to Culinarty's Original recipes event. A gift for you in my blog. Dershana thankyou for your sweet gift.happy to recive from you. that looks so nice and inviting!